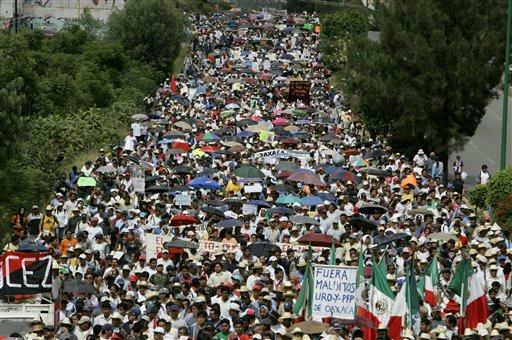 2006 APPO march in Oaxaca to demand that the governor resign. Wounded, offended and humiliated, Oaxaca prepares the response. Millions of Oaxacans, those who live in Oaxaca or those that have felt in their own flesh the offense to their native soil although they are very far from it, begin to express their dignified rage. We suffer, like all Mexicans, the reign of impunity. Its spectacular symbol was El Chapo’s escape, with which the treatment that certain criminals receive was given national and international publicity. The most cynical version of that tonic is the formal exoneration of Peña and Videgaray for their acquisitions of the Casa Blanca and other properties. Its most atrocious expression is without a doubt having set free two of the intellectual authors of the murder of teacher Galeano in La Realidad, on May 2, 2014. “Impunity without concessions,” Magdalena Gómez says upon commenting on this operation, which makes up part of a well-known series that includes Tlataya, Tanhuato, Apatzingán and Ayotzinapa… The plague was manifested punctually in Oaxaca when Gabino Cué extended a certificate of impunity to Ulises Ruiz, while the Truth Commission had still not finished the work of examining his crimes. At the same time, he took away from its members the tutelary protection that they require to carry out their tasks. The undeclared state of emergency forms part of the offense that is imposed on the country. This use of the law to establish illegality characterizes the creation of the “new Ieepo,” which abandons 30 years of formal commitments and annuls well-constituted rights. It’s the same tonic as new laws on indigenous matters that they just promulgated. They represent a clear setback with respect to what the Indian peoples had obtained in the course of recent decades; among other things, it implies kidnapping their ability to govern autonomously. This process, by which they dismantle step by step, as much by social groups as by geographic groups, all the elements of the state of law, will soon be extended to special economic zones, with which the federal government now threatens Chiapas, Guerrero and Oaxaca. These zones are not a state within the state, as has been said. They are areas in which the state’s formal design is abandoned and no more rights and freedoms remain than those of private property, of capital; in other words, they are areas in which it is shown without veils, in view of everyone, the real nature of the political regime of the Nation-State, which outside of them is dissimulated under the facade of representative democracy. What these zones represent requires careful analysis. It is an outrage even graver than the mining concessions and other forms of dispossession. Every day it becomes more evident that the teachers were a circumstantial and deceitful pretext for bringing 15,000 militarized police to Oaxaca. It is viewed that their presence is owed rather to the need of preventing and in this case impeding the resistance of the peoples, who defend their territory and their life in the face of all the dispossessions that they are suffering. Our principal challenge consists in transforming the discontent, more general all the time, and the dignified rage that spreads into wide circles of Oaxacan society in an effective form of organized resistance. And the even greater challenge is to convert that resistance into a capacity for transformation. It has been stimulating to verify the rapid circulation of whispering. In small groups, even of three friends in a cafe, in broader meetings, in assemblies, in forums, under the most varied circumstances, we have set to analyzing the situation and preparing for what follows. We quickly reached a consensus about the gravity of the situation. The rage that an accumulation of offenses and arbitrary acts provokes in us was demonstrated without reserve. Necessary venting is produced, in the intimacy that is affirmed in the community fabrics. It awakens the sociological and political imagination to conceive forms of response. And, the indispensable articulation to organize the resistance is frequently produced. Collective declarations that define the taking of a position already circulate. Facing the militarized occupation of Oaxaca and as the governor, the state Congress and the federal government renounce civilized ways of governing, the people get support from deposits of accumulated experience, particularly that of 2006, for organizing actions that permit transcending circumstance. We already know, even through very recent experiences, that it’s not enough to say no, we are opposed to the dispossession, to the militarization and to everything that we don’t want. In order to give backbone to the resistance and to give it meaning we need to express it as the construction of an alternative. We’re doing that, imagining it and trying to give it a reality.